I have been thinking a great deal about David Olyn the past few weeks. 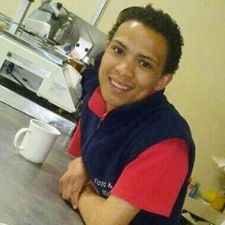 Olyn was a young man in South Africa who was killed several weeks ago in a horrific hate crime. The thing that makes me continue to think about him is seeing a picture of him. It could be the face of a number of other people I have known and loved as friends, pastored with, and learned where the hope for tomorrow lies. The fact that this violence happened in South Africa doesn’t make it any less immediate. Another one of our younger rainbow people has been taken away far too early by homophobic hatred. This could as well have been Mumbai, Kingston or Tampa. The minute we pity someone from another cultural context that we think of as more dangerous, we lose the value of genuine solidarity as an option. Solidarity is a response to injustice that asks us to stand in the place where we live with equal vigilance and fearless love. Solidarity asks us to stand shoulder to shoulder with our siblings around the world who are fighting to survive and stand at the coalface of human rights and struggles for dignity and safety. Solidarity also asks us to pay attention to our own backyards – this fight is also happening in our neighborhoods, schools, behind suburban doors, and in the projects. In progressive denominations we speak a lot about being inclusive, but solidarity in the way of Christ asks more of us. It asks us to de-privilege ourselves as a place that welcomes others to become communities who walk out from beyond our manicured grounds to meet the struggles of our times with genuine engagement and human-to-human solidarity. This year, our community is being asked to name and know who we are and what we are about. Perhaps the concept of solidarity is not the worst place to begin.